What’s better than pumpkin pie? Pumpkin pie bites with chocolate cookie crusts! I’m not sure why I thought a chocolate crust and pumpkin pie filling would go together (other than Halloween colors are orange and black, so I thought it’d be festive at least! ), but they do oh-so-fabulously. The pie filling recipe is from Liz‘s zine, Underwater Cigarettes #3, which features all kinds of fall/holiday feasting ideas (buy a copy! ), and I must say that the Pumpkin Pie-O-My! is pure deliciousness. The chocolate cookie crust is from my mom’s brain, then passed down to me genetically or something. Anyways, the chocolate crusts gave each bit a satisfying crunch and depth of flavor to match the spicyness of the pumpkin pie. Oh fall, you rule! Preheat the oven to 350 degrees. 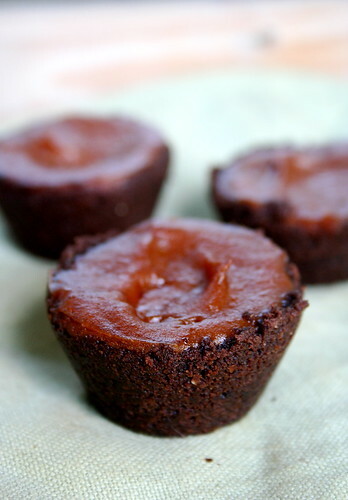 Spray four mini muffin tins with vegetable oil. In a large bowl, break and pulverize the graham crackers into small grains. You can use a food processer to quicken the process, but I like to get my hands all dirty. Add a tablespoon of soy milk and oil at a time until the cookie grains form a dough that you can mash into each muffin spot in the tin. Mash the dough into the muffin tins to form crusts that reach to the top of the tin. You want the crust to be thick enough to cover the metal tin, but not too thick so that you can fill it properly with the pie filling. In a food processer, mix all ingredients together until smooth. Spoon the pie batter into the muffin tins, filling each crust to the top of the tin. Bake for 30-45 minutes, or until an inserted knife comes out of a pumpkin pie bite clean. Let cool, then with a knife, pop out each bite. Eat warm or after cooling in the fridge! Beautiful! What brand makes a vegan chocolate graham cracker? I always say this, but I mean it (especially with those pie bites) = HOLY YUM!!! nuh uh. nuh UH! those look too good to be REAL. i love pumpkin. those are so cute and im pretty sure i’d eat 20 of them. Holy crap Jesorama – this is just freaking genius!!! I so want to try these! Those are so cute & dainty! You know what, I’ve never been huge on the pumpkin/chocolate combo. However, looking at those bites I feel like I should give it a second thought. These would be so great for a dinner party, so there’s no messy pie to cut and everyone gets their own individual piece! Oooh, yes please! I want these. Wow these look amazing, definitely on my “must-bake” list! the pumpkin choc chip muffin recipe that was floating around the internets a while back brought me over to this combination. i can totally get behind pumpkin pie with a choc crust. yum! these look so delicious! and cute. oh my goodness these sound so amazing. must make soon!